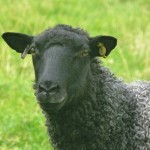 Blacker Sheep was set up by Sue Blacker when she took over the former Spinners Web flock. 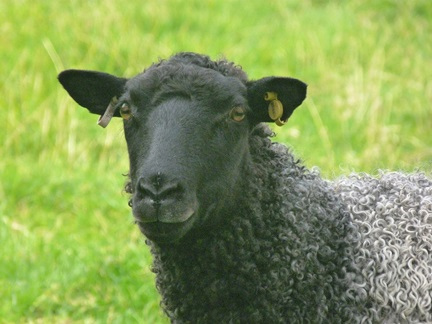 Sue had kept Gotland wethers for grass-cutting and wool for 8 years but since 2004 has managed a breeding flock. The main flock is kept on high land with a view of the sea near to Lostwithiel in Cornwall. There are three large paddocks and one small one, plus a barn, lambing pens and rams’ house with a yard. Sue is continuing the Spinners Web environmental traditions, with rainwater collection, an owl box and conserved Cornish hedges. Sue’s wool is mainly sold direct as fleeces to The Natural Fibre Company and she also sells sheepskin rugs and meat. Please contact her in April and November for freshly shorn fleeces for hand spinning if required. The Blacker Sheep flock has particularly fine wool with a tight crimp, very suitable for fine spinning and the flock is bred primarily for wool, to reduce hair and britch wool, etc., and also for temperament, with skins and meat as secondary aims. In late 2005, Sue took over The Natural Fibre Company, formerly in Lampeter in Wales, and relocated it to Launceston in Cornwall. See advert on Sponsors page for further information. Sue can provide rams, ewes and wethers, for suitable homes, with all ewes and rams scrapie geno-typed, and can also supply rams on a short-term basis for tupping.